SDA Bocconi School of Management and Josoor Institute, the Qatari center of excellence in sports and events industries, have formed a new partnership aimed at boosting managerial excellence in the field of sports and event management in the MENA region ahead, also in view of upcoming events like the 2022 FIFA World Cup Qatar™. The partnership will see Josoor Institute continue to offer and award its two flagship professional diploma programs in Sports Management and in Major Events Management, designed to enhance the knowledge and skill sets of those hoping to pursue careers in the Sports Management or Events Management field or who already hold positions in these dynamic and exciting fields. Josoor Institute is a centre of excellence for the sports and events industries that is inspired and developed by the Supreme Committee for Delivery & Legacy in Qatar. Launched in December 2013, Josoor Institute has had over 4000 delegates attend its programmes and workshops, which have been delivered by over 400 world-class speakers. It has also successfully completed two cohorts of its flagship professional diploma programmes that have had close to 150 delegates from Qatar and the region graduate. SDA Bocconi will be the lead academic partner, providing executive education and organisational oversight to Josoor Institute for the two flagship professional Programs, managing the development and delivery of program contents, the selection of faculty, and all faculty and delegate assessments. Each program consists of six modules. For the first edition the programs will take place from March 2019 to December 2019. Each module is offered in one, week-long delivery blocks in Doha. The partnership is for the period 2019-2022. Giuseppe Soda, SDA Bocconi Dean, underlines: “We like to conduct rigorous, relevant and multidisciplinary studies that are able to directly impact people and international organizations. This partnership is in line with our identity and mission. The industry of Sport is growing, and Qatar is a leading and innovative country that is investing in this direction. Working with the Josoor Institute will give us the possibility to contribute to the development of individuals and organizations by creating and disseminating innovative managerial knowledge about sport and event management”. Dino Ruta, SDA Bocconi Professor, Sport Knowledge Centre Leader and Academic Director of the partnership, underlines: “Sport is a universal language, a significant presence in our life and culture with different interpretations: sport as a way to entertain and engage, sport as a way to reach wellbeing and a healthy lifestyle, sport as a way to educate and develop soft power. This is SDA Bocconi’s view which aims through this partnership with the Josoor Institute to promote managerial culture in Qatar and in the MENA region. Together, we will create and diffuse state of the art knowledge for economic and social development through sport”. Pasquale Salzano - Ambassador of Italy to Qatar said: “I am very proud, as Italian Ambassador, to witness the kick-off of a partnership between the prestigious international top-ranked Bocconi School of Management and the Josoor Institute, aimed at promoting new education programs in sports and events management. Doha is becoming an important hub in the region for hosting international sport competitions, not only due to its excellent facilities but also for the idea that the role of sport should have in the development of communities and in the education of new generations. In this regard, Italy and Qatar share the same vision: we strongly believe that sports can benefit our societies with a positive influence on a healthy lifestyle and promotion of high moral values. It is above all thanks to such values and to cultural and academic interactions that the bonds of friendship between countries grow and achieve new ambitious levels. This is true also for Italy and Qatar, which have become closer and closer not only through trade exchange and high-level political visits but also – and more deeply – through cooperation in the cultural field and dialogue. Partnerships between leading universities and institutions can greatly contribute to further develop the relations between our countries. I believe that this initiative is an important investment for our future and that it will also create an important legacy for years to come in line with the vision of the Supreme Committee for Delivery and Legacy. 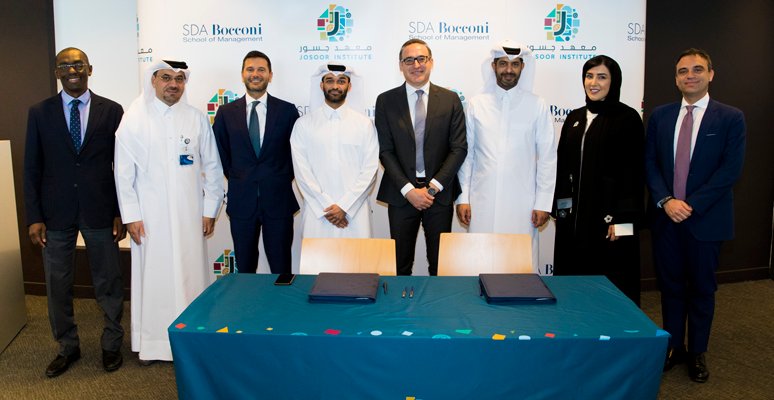 I would like to wish all the best for a successful cooperation between SDA Bocconi and Josoor Institute and for the future career paths of the young talented students they will be training over the next few years”.